When we learn new things, our brains reorganize. This process produces feelings of confusion and frustration. I like that state, and always pursue the limits of my understanding. Keeping the above in mind, I explored the current Plasma desktop ideas. Very interesting, in fact, not frustrating at all. I've often wanted to explore the idea of zooming in and out of various work areas, or areas of interest. Right now I have 10 windows in my panel, and often have more, depending on what I'm doing at the moment. I would love to be able to zoom in and out of tasks, leaving everything open and where I left it. OS/2 had attempted this with the Workplace Shell. You could create a folder (don't remember the terminology of the time) with links to applications or files, open the folder which opened the applications, closed the folder which closed the applications. Handy, but flawed. The api was closed of course, and to do anything mildly useful required using undocumented interfaces. And the Workplace Shell didn't show the filesystem, but had something akin to .desktop files that linked to the various real files. So if you moved the physical files, the whole thing got confused. And in practice, it was flakey. Plasma didn't make the same mistake. Nice. So far not much new learning for me. Only questions, which will be answered in time as things get done. If you click on the cashew thingy, one item is Zoom Out. Try it. Your desktop, not including panel, will shrink. If you left click on the checked background, you can slide it side to side, hiding your desktop. There is lots of real estate open for exploitation. Click on the cashew thingy, and another item shows up. Add Activity will create another desktop. You can add widgets to that, zoom in or out to each one. Cool. So here comes the questions. Will applications be able to work within the plasma zooming scheme? That would be a killer. Or will applications based on the plasma api be the only ones? Then the tricky parts. This could get complex in a hurry, which I have no problem with. But how to allow a user to keep track of what is there, easily switching etc. I see that the panel we know doesn't really fit into the paradigm. What would replace it, and how? As it stands it is just starting to be useful. There is a pile of work to be done yet, and I eagerly await what is to come. One thing for sure. My monitor is suddenly too small. And I don't feel the slightest frustration. Maybe time to delve into the plasma api. I'm sure I'll get there quickly enough. I read this comment on the Dot earlier this week. It stuck in my mind, and I wanted to share it: (link) It was written by someone called outolumo. "Couple years back I moved to France for 11 months, didn't know the language, anyone in there, and for the first two months my only access to Internet - to keep me at least somewhat sane - was in an Internet café, where I visited about once a week or so. And besides reading my mail (which there never was too much), how did I use that time? By reading carefully about the developments of KDE4 (and 3) from the KDE Commit-Digest..."
I don't know if he was reading what I did, or what Danny does. Doesn't matter. I know that comments like this give a burst of energy. All this discussion about users vs. developers obscures what really matters. What would move someone to write, debug, translate, draw artwork, study usability, test, file bugs, document something like KDE? LWN interviewed a kernel hacker named Peter Zijlstra and we learn what motivates him. Here is the link. I understand what he says, and feel the same excitement and pleasure in solving difficult problems. One of my proudest moments was when I learned that someone quit their job as a result of my speaking up. I won't bore you with the story, but what I said cut through all the messaging and managing of expectations and easing of the customer experience, helped a fine gentleman realize he was working for a bunch of snakes, and he quit. The killer feature of free software is it's lack of artifice. Software is a product of the human mind, and since the human mind ranges from intolerably stupid and destructive to sublime beauty, software reflects those extremes. Of course, most minds and software are somewhere in between. Free software processes expose the reality, closed software tries to hide it. I mistrust software, although I have an implanted device run by software that keeps me alive and well. I know bugs exist in all software, and gleefully climb into an airplane run by software. I know I could lose all my data, but I run KDE 4 from trunk. I would hope that one gift free software gives to humanity is a realization of the frailty of software development. For that reason, exposing the process of free software development is extremely important. But equally, the exposure of this reality imposes a discipline. Most ideas look wonderful until they are exposed to the light of day. And like all human endeavors, great ideas are usually the result of many bad ones. The killer app of free software is the process. The products range from awful to awesome, but the process, in all it's beauty and ugliness, has challenged well financed development houses. Any attempt to protect users from the process will inevitably hurt the product. We have a saying at work that the paying customer is always right. Those who can pay, who can contribute to the process, will and do appreciate the exposed nature of the process, including the rough and tumble and the uncertainty of the development process. That rough and tumble and uncertainty and much more will come out when developers speak their minds. And tell us the neat things they are doing. And show us pictures of their kids. Why would anyone give their time to work on free software if they couldn't show off their kids? Speaking of intolerably stupid and destructive, Mussolini said "Ruling the Italians is not difficult; it's pointless." It is not difficult to control the message. Disaggregate some bloggers, like me for example. Write a community communication manual. But why? It's pointless. In fact, it's counterproductive. In case you're wondering, in the situation I described above, there was no need for abuse or yelling. Just a simple clear description of the truth sufficed. I talk to the gentleman nearly every week at his new employer, and the enjoyment is mutual. The KWallet icon showed up in my panel. I'm at Revision 821975. See, I'm not that hard to please. Ground source heat pumps use the warmer temperature of the earth as a source of energy. They are efficient if sized and installed properly. They are also sold as "going to save us all" solutions, which leads into emotional purchase territory. Large purchases. The Canadian government gives a grant of $8000 for an installation. It isn't unusual to have people spend $25-35K on a heating system, and there was a $175K system put in not far from here. The only problem is that many of the systems don't work. Work in the sense of saving energy, or even sometimes heating the home. They are sized to get the sale, not to solve a problem. One customer has a system that doesn't work, but the esteem given to someone enlightened enough to have such a system is worth the monstrous heating bills. I'm not joking. The system doesn't work. Many don't. But no one complains or says anything because they know they were suckered by a sales pitch, and they convince themselves that they made the enlightened choice. Even if it doesn't work. The $175K system I referred to didn't work. At least it didn't work during the winter when it was cold. The fellow had a multimillion dollar house at 55F 12C in February. I was told by a customer that I didn't understand such systems and therefore my opinion that it didn't work was invalid. You see, I deal with this BS all the time. Overpromise and underdeliver works only if people pay way too much money and are ashamed of telling everyone how foolish they are. Some have commented that my descriptions are negative. I hate graphical file managers. Not only graphical. I hated the text mode filemanagers of yore. I feel deep comfort seeing the lonely and stark command prompt. Using Dolphin the other day to browse through my drives, I realized why. I would dislike affixing a large magnifying glass in front of my face. Hence the command prompt. I tell it what I want to see, and it shows me. Dolphin starts up with an incredibly cluttered interface. No, not the menus, toolbars and the like. Every addition is painstakingly decided and parsed. But the 251 Items, (88 Folders, 163 Files) show up unbidden and undesired. In the Tools menu there is a helpful Show Filter Bar selection, which brings up a text line where you can enter some kinds of filter. Forget everything you know about wildcards and the like, it doesn't work. If you type the first letter of a folder, it will list all folders and files whose name contains that letter. If you select the folder, the filter stays, and to see what is in the folder you have to clear the filter editor. Maybe I will implement T days, or if I'm particularly grouchy, Y days, only seeing the filtered files and folders with that letter included. If only the darn thing showed up next time I ran Dolphin. Maybe if I ran the thing more than once every three weeks I could remember where to find the menu selection. Maybe if it showed up when it started I might run it more than that. But no, clutter is evil. Except in the file listing. This is where I start looking for the little X button. Did I mention that I hate graphical file managers? But I persist. Konqueror did automatic file previews. This was one feature that overcame my apprehension of graphical file managers. Dolphin does similar. The file type is identified by an icon, and as you hover, the preview shows up in the information panel. It is a bit small, showing just not quite enough information to identify a text file for example, but adequate. Definitely a plus. Clicking on a file loads a viewer or editor as expected. I miss the embedding from Konqueror. Hovering and previewing or even getting a left menu takes a long time. The application becomes unresponsive. Hopefully it improves by release time. Tabs are supported, but as of 819969 drag and drop between tabs doesn't work. Strange, but I think it did work at one time. Not sure. A neat feature that I just noticed is the ability to zoom in and out. It changes the density of the view pane, increasing or decreasing the size of the icons. The small icon size messes up the + and - clickable points though. There is no indication once you click or hover whether something is happening. That may be a kde4 issue. As I said, I don't like graphical file managers. Dolphin has some sweet spots and if it was lightning fast, much could be endured. I'm sure that will improve in time. 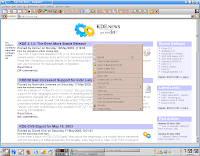 If you are looking for a reason to move to KDE4, Gwenview is it. I took some pictures of our dog for my wife to upload to Facebook, and to email to our daughter who is seeing the world with an Eeepc in her luggage. Our camera uses Xd memory cards, and I've got a handy Lexar JumpDrive usb dongle gizmo that reads all the card varieties that I use. I use KDE4, she is still in kde3.5. 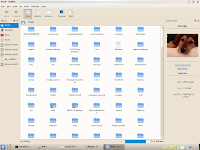 In kde4, it was a matter of mounting the drive in Dolphin, left click on the folder, run Start a Slideshow which loads Gwenview. It was easy and quick to select the pictures we wanted. In Kde3.5.x, it was more difficult. Oh yes, there is digikam and other picture viewers. I ended up using kuickshow for speed and simplicity. It's almost time to migrate. Everything else is coming along nicely. Gwenview is the killer app. Kudos to Aurélien Gâteau. Last thursday evening we had a lightning strike somewhere close. A surge came through the phone line, which was plugged into a pci modem, which smoked the motherboard, jumped across to the ethernet card and smoked the wireless router. Somehow a usb 4 port adapter was hit. Our television is dead. Our neighbors had various things but I think we got the worst. Great fun. "Second languages learned after the critical period (8 years to puberty) are not processed in the same part of the brain as is the native tongue". When I read french, I understand but don't 'get' what it says. This is a quote from the book The Brain the Changes Itself by Norman Doidge. (Amazon) For a long time neurologists believed that the brain was localized, ie. each physical section of the brain controlled specific functions. Nobel prizes were won by researchers that described brain function in that way. But it is only partly true. It seems that our brains are plastic, adaptable, constantly changing, rearranging depending on the use that we make of it. Our brain function or more exactly dysfunction is evident when there is an injury that causes disability. My favorite story from the book is a woman who had her vestibular system damaged by medication. She had no sense of balance, and was either falling or feeling she was falling through space. A device was placed on her tongue which gave 2D electrical stimulation patterns based on an accelerometer on her head. Almost instantaneously she regained her sense of balance as her brain identified and interpreted the stimulation pattern on her tongue. Remarkably after a few months of regular use, she regained her balance even without the device. Her brain learned, adapted, somehow. Jeff Hawkins invented the Palm Pilot. He was involved in various ventures to do with Palm type devices. Having worn out 3 Palm handhelds, I took note of his name mentioned in the context of brain and intelligence research. Business Week article He describes intelligence as sophisticated pattern matching which permits prediction. Or something like that. Another book to read.